Protologue: Rees, Cycl. 16: Gmelina 4 (1810). Gmelina, yemane, Kashmir tree, white teak (En). Gmelina, peuplier d’Afrique, yemane (Fr). Gmelina arborea is native from Pakistan south to Sri Lanka and east to Myanmar, Thailand, Vietnam and southern China. 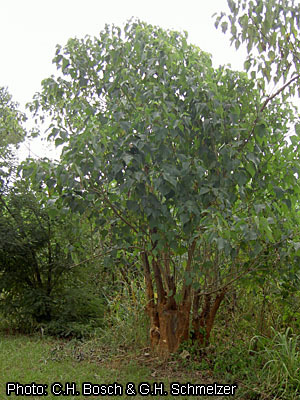 It is extensively planted as a fast-growing tree in tropical areas of Africa, Asia and America. In tropical Africa it is planted in many countries, and large-scale plantations are found in Senegal, Gambia, Sierra Leone, Côte d’Ivoire, Mali, Burkina Faso, Ghana, Nigeria, Cameroon and Malawi. The total area of gmelina plantations in Africa has been estimated at 130,000 ha. The wood is suitable for general utility purposes, especially light construction and structural work, general carpentry, packaging, carvings, utility furniture and decorative veneers, with excellent woodworking properties. Additionally, the wood has been used in light flooring, for musical instruments, matches, particle board, as a mine timber, in vehicle bodies and ships. It is suitable for telephone posts when treated with preservatives. It produces good-quality pulp; unmixed semi-chemical pulp is only suitable for carton board or low-grade writing paper, kraft pulp is suitable for higher grades of writing paper. The wood is often used as firewood and for charcoal. Gmelina is planted as an ornamental, avenue and shade tree in urban and peri-urban areas. It is also used in coffee and cocoa plantations to protect the young crop and to suppress noxious grasses. It is useful as a firebreak because it suppresses undergrowth and its leaves decay rapidly. It is often planted as a windbreak and hedge. It has potential for reforestation in dry forest regions. In tropical Asia roots, bark, leaves, fruits and seeds are used in Hindu medicine. Both the fruit and bark have medicinal properties against bilious fever. Leaf sap is taken as a demulcent to treat gonorrhoea and cough, and it is applied to wounds and ulcers. The roots are considered to have tonic, stomachic and laxative properties, and the flowers have been used to treat leprosy and blood diseases. The fruit is edible. The leaves are widely used as cattle fodder, and in silkworm culture. The wood ash and fruit yield very persistent yellow dyes. The flowers produce abundant nectar, from which a high-quality honey is produced. The majority of gmelina timber is used locally. This fast-growing and comparatively cheap timber can supply local markets when there are no special requirements with regard to the wood. Exports are limited. In 2001, 1000 m³ of round logs (‘yemane’) were exported from Myanmar at an average price of US$ 69/m³. Doors, windows and frames made of gmelina wood were exported from Côte d’Ivoire a few years ago, but the quality was poor because of too many knots. In 2005 a company in Senegal offered 50,000 m³ of standing gmelina timber for sale. The heartwood is pale brown to yellowish brown, sometimes with a pinkish tinge, and indistinctly demarcated from the whitish, 5–7 cm wide sapwood, which has sometimes a greenish or yellowish tinge. The grain is straight to interlocked, texture coarse. Growth rings distinct in regions with a marked dry season, not distinct in other regions. The wood is somewhat oily to the touch. Gmelina is a lightweight hardwood. The density is 400–510 kg/m³ at 12% moisture content. It has been found to increase gradually from the pith outwards in planted trees of 8 years old in Nigeria, and also upwards in the bole. Studies in Nigeria have shown that there is a high correlation between density and age. The rates of shrinkage are low, from green to 12% moisture content 1.2–1.5% radial and 2.4–3.5% tangential, from green to oven dry 2.4–3.3(–5.3)% radial and (4.3–)4.9–6.4(–7.4)% tangential. Seasoning is reported as either good and fairly rapid or slow with some risk of warping and collapsing that may result from either genetic variation or growing conditions. Air seasoning may take about 3.5 months for boards of 12.5 mm and about 11 months for boards of 38 mm thick. Kiln drying of the wood is satisfactory. It takes about 2 weeks to kiln dry boards of 25 mm thickness from green to 12% moisture content. Recommended temperatures to kiln-dry boards up to 38 mm thick vary from 42°C for green wood to 60°C for wood of 20% moisture content, and from 46°C to 66°C for planks over 75 mm thick. Once dry, the wood is in general very stable in service. At 12% moisture content, the modulus of rupture is 55–102 N/mm², modulus of elasticity 5500–10,800 N/mm², compression parallel to grain 20–39 N/mm², shear 5–11 N/mm², cleavage 12–15 N/mm and Janka side hardness 2335–3380 N.
The wood saws easily and has only slight blunting effects on tools. It planes to a smooth finish and polishes well. When knots are present in the wood, cutting angles should be reduced. The wood is too soft for satisfactory turning. Nailing is fairly easy, but pre-boring is recommended for screwing as the wood tends to split. Rotary peeling and slicing are easy even without pretreatment, and the veneers are easy to handle without a tendency to tear; they remain flat during drying. The gluing properties are reported as good. The wood is not durable and should not be used in contact with the ground under tropical conditions, but the more dense heartwood is moderately durable. It is poorly resistant to fungi and to termite and marine borer attacks. 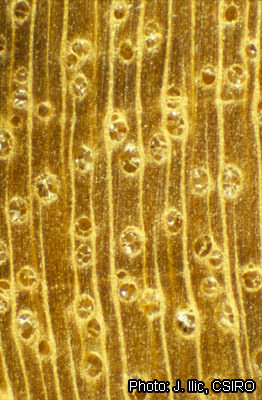 The heartwood is difficult to treat with preservatives, probably due to the presence of numerous tyloses. 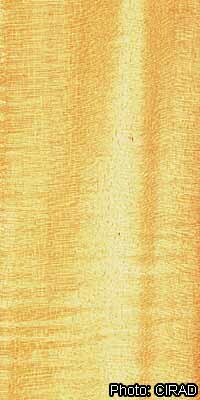 The wood pulp is usually rather short-fibred, but the fibres are comparatively flexible. Fibres of 5-year-old trees from Côte d’Ivoire were on average 1005 μm long and 32 μm wide, with a wall thickness of 5.5 μm, a flexibility coefficient of 81.7 and a felting index of 31.2. The quality of paper made from the pulp can be improved by the addition of small amounts of longer fibres. Results from various analyses of the chemical composition of the wood are fairly uniform. The lignin content is 27%, ash content 1% and extractives content 5%. The content of holocellulose is generally high and varies between 67% and 81%. The wood is not very suitable for firewood. The energy value is 20,150–20,750 kJ/kg. The wood burns quickly, and the charcoal burns well and without smoke, but leaves much ash. Deciduous medium-sized tree up to 30(–40) m tall; bole cylindrical, frequently bent, up to 80(–140) cm in diameter, at base slightly swollen, without buttresses; bark smooth or scaly, corky, grey to yellowish grey or pale brown; crown with widely spreading branches. Leaves decussately opposite, simple; stipules absent; petiole 5–15 cm long, short-hairy or glabrous; blade heart-shaped to broadly ovate, 10–25 cm × 5–20 cm, cordate or truncate at base but shortly attenuate into the petiole, acuminate at apex, entire to toothed at margin, with 2 glands at base of blade, glabrescent above, hairy below, 3(–5)-veined from the base and with 4–6 pairs of lateral veins. Inflorescence consisting of cymes arranged in a terminal or axillary panicle up to 40 cm long. Flowers bisexual, zygomorphic, 5-merous; calyx broadly campanulate, c. 5 mm long, densely hairy, with small triangular teeth; corolla 2.5–5 cm in diameter, yellow-brown to orange, tube funnel-shaped, widened near apex, 2-lipped, upper lip 2-lobed, lower lip 3-lobed; stamens 4, 2 long and 2 short, inserted at the base of the corolla tube; ovary superior, ovoid, 4-celled, style slender, stigma 2-lobed with unequal lobes. Fruit a globose to obovoid, fleshy drupe 2–3.5 cm long, glossy and yellow when ripe, seated on the accrescent calyx, 1–4-seeded. Seeds oblong to lens-shaped, without endosperm. Seedling with epigeal germination; cotyledons slightly fleshy. Gmelina comprises about 33 species and occurs in tropical Asia, Australia and islands of the Pacific Ocean. It is related to the large genus Vitex, which also includes several timber trees. Vitex can be distinguished by its more narrowly funnel-shaped corolla and less fleshy drupe. Gmelina elliptica Sm. and Gmelina philippensis Cham. are occasionally planted as ornamental shrubs, the former in e.g. Tanzania, Réunion and Mauritius, the latter in e.g. Kenya and Tanzania. Gmelina elliptica has locally become naturalized in Mauritius. Vessels: 5: wood diffuse-porous; 13: simple perforation plates; 22: intervessel pits alternate; 23: shape of alternate pits polygonal; 26: intervessel pits medium ( 7–10 μm); 30: vessel-ray pits with distinct borders; similar to intervessel pits in size and shape throughout the ray cell; 31: vessel-ray pits with much reduced borders to apparently simple: pits rounded or angular; 42: mean tangential diameter of vessel lumina 100–200 μm; (43: mean tangential diameter of vessel lumina ≥ 200 μm); 46: ≤ 5 vessels per square millimetre; 47: 5–20 vessels per square millimetre; 56: tyloses common. Tracheids and fibres: 61: fibres with simple to minutely bordered pits; 65: septate fibres present; 68: fibres very thin-walled; 69: fibres thin- to thick-walled. Axial parenchyma: (76: axial parenchyma diffuse); 78: axial parenchyma scanty paratracheal; 79: axial parenchyma vasicentric; 91: two cells per parenchyma strand; 92: four (3–4) cells per parenchyma strand; 93: eight (5–8) cells per parenchyma strand. Rays: 98: larger rays commonly 4- to 10-seriate; 104: all ray cells procumbent; 106: body ray cells procumbent with one row of upright and/or square marginal cells; 114: ≤ 4 rays per mm; 115: 4–12 rays per mm. Mineral inclusions: 150: acicular crystals. The primary root is long and slender at the initial stage, but then thickens and produces a moderate number of lateral roots. The depth of the root system varies. In good provenances growth of young trees is very rapid during the first 6 years, but decreases sharply from the 7th year onwards. Gmelina is a short-lived tree, which reaches an age of 30(–50) years. Under favourable conditions it can reach a height of 3 m in one year and 20 m in 5 years, and a height of 30 m and a bole diameter of 50 cm in 20 years, but growth is strongly site-dependent and 10-year-old trees can vary in height from 5 m to 30 m. Under optimal conditions the bole is straight with good natural pruning in dense stands, whereas under poor conditions the plant will develop to a shrub only; all intermediate habits occur. Isolated trees develop very large branches. The tree is deciduous except in the first year, and flowering occurs when new leaves have just begun to develop, but intensity of flowering varies. The inflorescence develops gradually during 6–10 months, so that all stages from flower buds to mature fruits can be found in a single inflorescence. Flowers open during the night and remain open for 1 day, rarely 2 days, before they fall. Gmelina is self-incompatible; self-pollinated flowers abort within 15 days. Bees serve as pollinators. Pollen is produced in the morning and the stigma is receptive from sunrise to 13.00 h. Fruits mature in about 38 days, and they are ripe when the colour changes from green to yellow. Fruiting tends to be annual. Trees 3–4 years old can flower and fruit regularly. The fruits attract birds, bats and other mammals, which disperse the seeds. Gmelina is rather common in its natural distribution area, where it occurs in habitats varying from rain forest to drier deciduous forest. It reaches its maximum size in the more humid forests of Myanmar, especially in humid fertile valleys. It can be grown up to 1400 m altitude (e.g. in Ethiopia), but is then usually stunted. It thrives in climates with a mean annual temperature of 21–28°C, with a mean maximum temperature in the hottest month of 24–35°C, and mean minimum temperature in the coldest month of 18–24°C. In its natural range the annual rainfall varies from 750 mm to 4500 mm, but the optimum lies round an annual rainfall of 1800–2300 mm in areas with a dry period of 3–5 months and a relative humidity of at least 40%. Although gmelina can be found on a variety of soils, it prefers deep moist soils with an ample supply of nutrients. Growth on leached acid soils is poor. When established under poor conditions, trees often remain stunted or become little more than a shrub. In plantations they require a well-drained fertile soil and do not stand waterlogged sites. Gmelina is an opportunist species in rainforest and has been classified as a long-lived pioneer. It has a high light requirement. It has become naturalized in many African countries, where it may be somewhat invasive. Gmelina is normally propagated by seed. One kg contains 660–3000 stones, each generally containing 1–2 seeds. Stones from freshly collected fruits (with fruit wall still yellow-green to yellow) show the best germination results, with a germination rate of 65–80%. Fruits are collected from the ground. Green fruits need after-ripening in thin layers under shadow until they become yellow. The fruits should be depulped completely to prevent loss of viability. Fermentation in running water facilitates depulping. For large quantities, a modified coffee depulper can be used, which may process 50 kg of fruits per minute. About 400 kg of fresh fruits are needed for 50 kg of wet depulped stones. Further washing is required to remove any remnants of the pulp, which will otherwise cause rapid fungal infection during storage. For longer conservation, the moisture content should be reduced to below 10% by kiln drying at 40–55°C. Considerable loss in viability occurs within 6 months of storage at room temperature. Stones stored at room temperature should be soaked in cold water for 1–2 days before sowing, those with low moisture content should be imbibed in the dark for 30 days in moist sand at 20°C. The pointed end of the stone should be removed to accelerate the humidification of the seeds. In the nursery the stones are sown on germination beds, preferably in a mixture of sand and loam. The blunt end should be approximately level with the soil surface. Spacing should be 2 cm × 5 cm and the seeds should be covered by a thin layer of sand. Germination occurs after 2–3 weeks. The seedlings are potted in polythene bags after the first pair of leaves has appeared. They can be planted in the field when they reach a height of 23–30 cm, which is usually after about 6 months. Planting into the field is usually done at the onset of the rainy season. The use of stumps is the easiest planting technique. Direct sowing after extensive site preparation has sometimes been successful. Propagation by cuttings taken from coppiced elite trees is widely practised. Apical cuttings are taken from 2–3-week-old sprouts 12 cm long with the terminal bud and 4–6 leaves reduced to one third of their surface. Half-leaf single-node cuttings can also be used if planted in a shaded nursery under mist. Antifungal treatment is necessary, but hormonal treatment should be avoided because this may cause necrosis at the base of the cutting. However, earlier and more vigorous rooting induced by hormones has also been reported. Cuttings placed in containers under mist have a success rate of over 70%. Methods for in-vitro micropropagation using nodal segments have been developed in India, but they have not been optimized to enable large-scale propagation. Propagation is also possible by marcotting or layering (success rate 70%) or by approach grafting (55%). In West Africa the best time for grafting is the end of February to the beginning of March, before the axillary buds become active. Grafted plants should be kept under shade and mist for 2–3 weeks. Grafts may be obtained from adult trees, with a success rate of 45% even when using 34-year-old trees. The usual spacing in the field ranges from 2.5 m × 2.5 m to 3.5 m × 3.5 m. Intercropping gmelina with crops such as maize, cassava or yam is often practised, with a wide spacing (4–5 m × 4–5 m) for gmelina, which benefits from the agricultural practices used for the crops. For pulpwood and firewood production, a spacing of 2 m × 2 m is recommended. It may be necessary to take measures on sloping ground before planting, to avoid erosion. Natural regeneration is usually not abundant in plantations as the seedling demands light. It is important to select the best provenances and to balance the spacing with the development of good stem forms. Narrow initial spacing combined with early and regular thinnings improves stem form. Pruning is essential to reduce heavy branching and forking and to produce long clear boles. As gmelina has a high light requirement and is sensitive to competition, good site preparation and weeding is required to ensure good growth and establishment. Young trees should be protected from livestock. In Ghana rotations of 6 years are used for pulpwood purposes, while for sawnwood the usual rotation is 10 years. 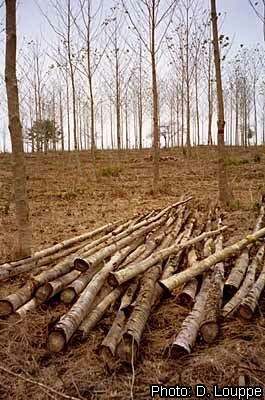 The second rotation is produced by coppicing. For a third harvest a new plantation is established. Weeding is carried out 3–4 times during the first 2 years. In dense plantations trees shade out weeds. With 10-year rotations, the stands are thinned to 50% after 5 years and again after 7 years. Ample addition of fertilizer is required to maintain sufficient growth during the second rotation. Gmelina may be planted in mixed stands with Triplochiton scleroxylon K.Schum., which demands similar silvicultural practices. A 22-year-old plantation in Côte d’Ivoire had 94 Triplochiton scleroxylon trees per ha with a mean bole diameter of 38 cm and 60 gmelina trees with a mean bole diameter of 34 cm. Gmelina may also be grown together with Acacia auriculiformis A.Cunn. ex Benth., which is a nitrogen-fixing tree used for firewood and amenity timber, planted as understorey to improve the soil, protect against erosion and improve natural pruning of gmelina. Serious fungal infestation has been observed in various locations. In Africa fungal diseases are mainly root diseases of nursery seedlings, caused by Gibberella fujikuroi and Sclerotium rolfsii in West Africa. In Côte d’Ivoire and Nigeria Armillaria mellea, Chaetophoma sp., Polyporus sp. and Thanatephorus cucumeris have also been recorded as fungal diseases. Defoliators are very common, both on seedlings and mature trees. Common defoliating insects in gmelina plantations in Nigeria include Achaea and Apophylia species and Zonocerus variegatus. Within the natural distribution area of gmelina disease and pest problems are often more serious and have even led to complete failure of plantations. 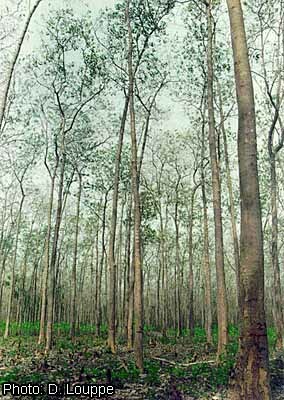 In India, Thailand and Malaysia the borer Acalolepta cervina (synonym: Dihammus cervinus) has killed or severely damaged whole plantations. The time of harvesting depends on the objective of the plantation: timber, pulpwood or firewood. Harvesting is done year round, but production is higher during the dry months. Under favourable conditions gmelina is capable of reaching an annual increment of 20–25 m³/ha with impressive exceptions of over 30 m³/ha. On poor sandy soils a yield of only 84 m³/ha after 12 years was reported, whereas on very favourable soils a production of 304 m³/ha after 10 years can be reached. In a very good stand in Côte d’Ivoire the mean annual volume increment was 42 m³/ha until 5 years old and 27.5 m³/ha until 21 years old. After cutting, logs should not be left in the forest for longer periods, unless they have been treated with preservatives. Gmelina arborea does not seem to be in danger of genetic erosion as it is a widespread pioneer species in its area of natural distribution, although usually occurring scattered in the forest. Moreover, it is widely planted and many locally adapted ‘landraces’ exist. More than 60 provenance trials were established in the mid 1970s in a joint effort between 20 countries. The objectives were to determine the magnitude and pattern of variation among populations and to identify superior provenances. Seed was provided by institutes in India, Thailand, Ghana, Tanzania, Malawi, Côte d’Ivoire and Brazil, and trials were established by many research institutes all over the tropics, including Cameroon, Central African Republic, Gambia, Ghana, Malawi, Nigeria and Senegal. Gmelina is comparatively easy to breed because of its fast growth, early flowering and good response to selection. In provenance trials gmelina plants originating from plantations often performed better than those originating from the forest in the natural distribution area. This can be explained by a positive selection during thinning in the plantations, lower inbreeding in plantations, or adaptation to local conditions. This suggests that important gains can be obtained by tree improvement programmes in gmelina because it responds strongly to domestication through plantation silviculture. In trials in different countries, a provenance (‘Bamoro’) originating from Côte d’Ivoire showed good results concerning adaptability, wood volume production and stem form. This provenance, propagated by cuttings, has been used to establish some industrial plantations. In 1969 FAO experts assigned top priority to gmelina for improved utilization and conservation. It was considered very promising due to ease and cheapness of plantation establishment, rapid growth and thus expectation of early returns, and good wood characteristics. However, more recently the initial enthusiasm has been replaced by a lapse in interest in several areas because of disappointing results. The usually poor form and tapering of the bole limit its use for sawn timber. Moreover, gmelina performs very differently on different soil types. Breeding may overcome these problems, and the results of provenance trials suggest good prospects for improvement programmes, which should be accompanied by optimized methods of vegetative propagation. This offers possibilities for large-scale planting of gmelina for a variety of purposes (timber, woodpulp, firewood) and in environmental conservation activities where the vegetation cover has to be restored in the shortest possible time. Gmelina also has opportunities for more widespread planting as a shade tree, windbreak and firebreak. Boulet-Gercourt, M., 1977. Monographie du Gmelina arborea. Revue Bois et Forêts des Tropiques 172: 3–23. CIRAD Forestry Department, 2003. Yemane. [Internet] Tropix 5.0. http://tropix.cirad.fr/asi/yemane.pdf. July 2005. Hossain, M.K., 1999. 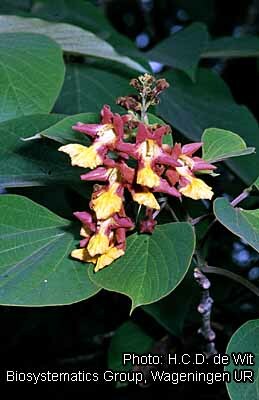 Gmelina arborea: a popular plantation species in the tropics. FACT 99-05. Forest Farm and Community Network, Winrock International, Morrilton AR, United States. 3 pp. Lamb, A.F.A., 1970. 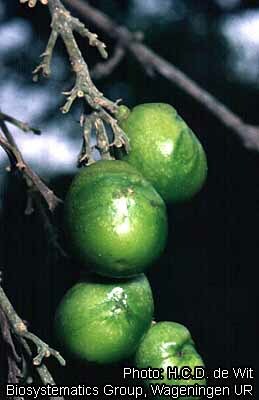 Gmelina arborea. Fast growing timber trees of the lowland tropics No 1. Commonwealth Forestry Institute, Oxford, United Kingdom. 31 pp. Lauridsen, E.B. & Kjaer, E.D., 2002. Provenance research in Gmelina arborea Linn., Roxb. A summary of results from three decades of research and a discussion of how to use them. International Forestry Review 4(1). 15 pp. World Agroforestry Centre, undated. Agroforestree Database. [Internet] World Agroforestry Centre (ICRAF), Nairobi, Kenya. http://www.worldagroforestry.org/Sites/TreeDBS/aft.asp. July 2005. Yap, S.K., Sosef, M.S.M. & Sudo, S., 1993. Gmelina L. In: Soerianegara, I. & Lemmens, R.H.M.J. (Editors). Plant Resources of South-East Asia No 5(1). Timber trees: Major commercial timbers. Pudoc Scientific Publishers, Wageningen, Netherlands. pp. 215–221. Adegbehin, J.O., Abayomi, J.O. & Nwaigbo, L.B., 1988. 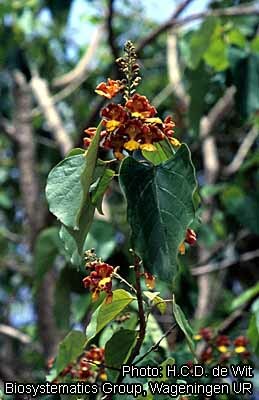 Gmelina arborea in Nigeria. Commonwealth Forestry Review 67(2): 159–166. Godeau, M., 1996. Etat d’avancement des travaux d’amélioration génétique du Gmelina arborea Roxb. en Côte d’Ivoire. IDEFOR, Abidjan, Côte d’Ivoire. 9 pp. Hamel, O., Malagnoux, M. & Vincenti, O., 1983. Essai: provenances de Gmelina arborea Roxb. au Sénégal. CNRF, Dakar, Sénégal. 19 pp. Kadio, A.A., 1990. Amélioration génétique du Gmelina arborea Linn. en Côte d’Ivoire: bilan et perspectives. CTFT, Abidjan, Côte d’Ivoire. 18 pp. Kouyaté, A.M., Coulibaly, F., Cissé, A, Tangara, M. & Anderson, J., 1991. Etude période de recepage Gmelina arborea. Commissions techniques spécialisées des productions forestières et hydrobiologiques. Ministère de l’Environnement et de l’Elevage, Mali. 17 pp. Lauridsen, F.B., 1986. Gmelina arborea Linn. Seed leaflet No 6. Danida Forest Seed Centre, Humlebaek, Denmark. 31 pp. Morel, J., 1983. Le Gmelina arborea en zone soudano-sahélienne. Bureau régional de la FAO pour l’Afrique, Accra, Ghana. 300 pp. Munir, A.A., 1984. A taxonomic revision of the genus Gmelina L. (Verbenaceae) in Australia. Journal of the Adelaide Botanical Garden 7: 91–116. Naik, D., Vartak, V. & Bhargava, S., 2003. Provenance- and subculture-dependent variation during micropropagation of Gmelina arborea. Plant Cell, Tissue and Organ Culture 73(2): 189–195. Richter, H.G. & Dallwitz, M.J., 2000. Commercial timbers: descriptions, illustrations, identification, and information retrieval. [Internet]. Version 18th October 2002. http://delta-intkey.com/wood/index.htm. May 2005. Romero, J.L., 2004. A review of propagation programs for Gmelina arborea. New Forest 28(2/3): 245–254. Vozzo, J.A., 2002. Tropical tree seed manual. USDA, United States. 899 pp. [Internet] http://www.rngr.net/Publications/ttsm. August 2005. Wong, W.C. & Khoo, K.C., 1980. Gmelina arborea - a literature review. Report 14. Forest Research Institute Malaysia, Kepong, Malaysia. Adam, K.A. & Krampah, E., 2005. Gmelina arborea Roxb. ex Sm. In: Louppe, D., Oteng-Amoako, A.A. & Brink, M. (Editors). PROTA (Plant Resources of Tropical Africa / Ressources végétales de l’Afrique tropicale), Wageningen, Netherlands. Accessed 11 April 2019. This page was last modified on 21 March 2017, at 10:44.